In this on-site visit to artist Fred Tomaselli's studio in Williamsburg--for which Will thanks the kind Greg Volk and Bruce Pearson--Fred and Will discuss the Williamsburg scene, offering more than proof enough of why this whole Williamsburg oral history project is such a good idea. Fred started out (artistically) in downtown LA, but came to New York because--back then--it was cheap. He was immediately drawn to Williamsburg because it was one of the few neighborhoods that artists could exist in without having to step over dead bodies. While Fred's assistant works diligently away at the newest collage, Fred discusses the imagery in his work--drugs, hallucinations, the numbing of the senses and good old narrative (34 minutes). 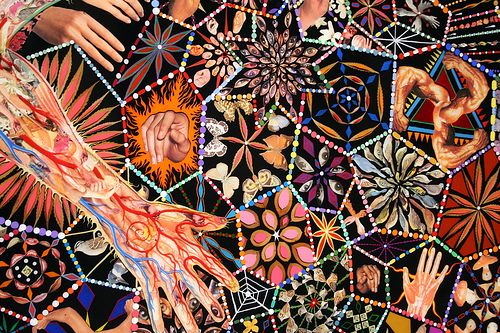 Fred Tomaselli's paintings have been called hallucinogenic and sublime, fetishistic and gorgeous. Join host Michael Rush in conversation with this singularly gifted California-born, Brooklyn-based artist as he ruminates on process and performance.